Join NCHN for a Member Orientation Call (valuable for all members) on Thursday, October 23rd @ 1:30 PM ET. RSVP for the call via email. Celebrate the Power of Rural Health: Submit your network's program/project/story to be shared on National Rural Health Day (November 20th). Save the Date: The 2015 NCHN Leadership Summit will be at the Sheraton Sand Key Resort January 19-20, 2015 in Clearwater Beach, Florida. Agenda and registration information will be posted soon. Make your reservations online. The Louisiana Rural Ambulance Alliance (LRAA), in partnership with the Louisiana Emergency Response Network (LERN) and the Louisiana Health Care Quality Forum (the state designated Health Information Exchange), established the Electronic-Rural Health Information Technology (E-RHIT) Network. Since its inception, the E-RHIT Network has expanded to include twenty three ambulance services and the Louisiana Traffic Records Coordinating Committee. Participation by LaHIE in the E-RHIT Network also expanded the footprint of the network to over 30 hospitals and 70 healthcare delivery facilities (physician offices, FQHCs, etc). E-RHIT is a network of ambulance services across Louisiana supporting the implementation and adoption of electronic Patient Care Reporting (ePCR). ePCR is used in these rural ambulances to document care given to patients at the time the care is provided and to record the type of incident. E-RHIT currently supports ePCR for ambulance services many of which are in very rural areas with limited cell phone reception. 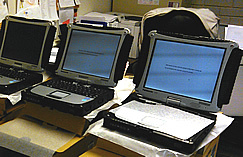 The software is installed in each ambulance on a ruggedized laptop that can connect to the state database via cellular network. The data collected consists of demographic, scene, and clinical information such as chief complaint and medications. Each service is also able to setup their own template and collect information that is relevant to their service area and local hospitals. Are you sitting too much on the job? So, I’m standing here at my desk, thinking about what to write for this month’s article, when I realize that no one sent me a network “chair story” since Mary Ann Watson’s response to the first article. This made me start wondering, if maybe a better article would be “Why do we need chairs?” Are we all sitting too much? I have received request from NCHN members asking if I had any recommendations on treadmill workstations, etc. I had looked for such options, but decided that I would never be able to walk on a treadmill and type on the computer at the same time. If any of you have found such a model and it works for you, please share! I’m sure others would be interested. Please join the NCHN Board in welcoming Union County Network of Clayton, New Mexico. Its mission is to build a strong and sustainable network of healthcare and other organizations that collaborate to improve the health and well-being of Union County, New Mexico residents and communities through improving healthy behaviors, access to and quality of clinical care, social and economic factors, and the physical environment. Organized in 2011, UCHN is an integrated network comprised of 10 members including hospitals, behavioral health providers, community-based organizations, a public health department, school, and local government. NCHN will be Celebrating the Power of Rural Health Networks on National Rural Health Day, November 20, 2014. Please join us in celebrating the power of rural by submitting your network's story. You can submit any story that tells of the work your network is doing to improve rural health. This may be a best practice model, success story, or lesson learned (aka triumphant effort with abysmal results). The important thing is telling the story of the work you and your members are doing every day to strengthen rural health. Stories will be shared on November 20, 2014, and featured in the NCHN e-News, NetworkTools.NCHN.org, and in RAConline.org's Rural Health Models and Innovations. GrantStation is offering a free tour of the GrantStation website at 2:00 PM ET on October 21st. Register here. NCHN Members can subscribe to GrantStation for a significantly reduced rate. Contact Christy for more information.